PiXELHD was created by the encoders known as PS3-TEAM. After a long stint of encoding for HDME they decided to move to their own tracker. 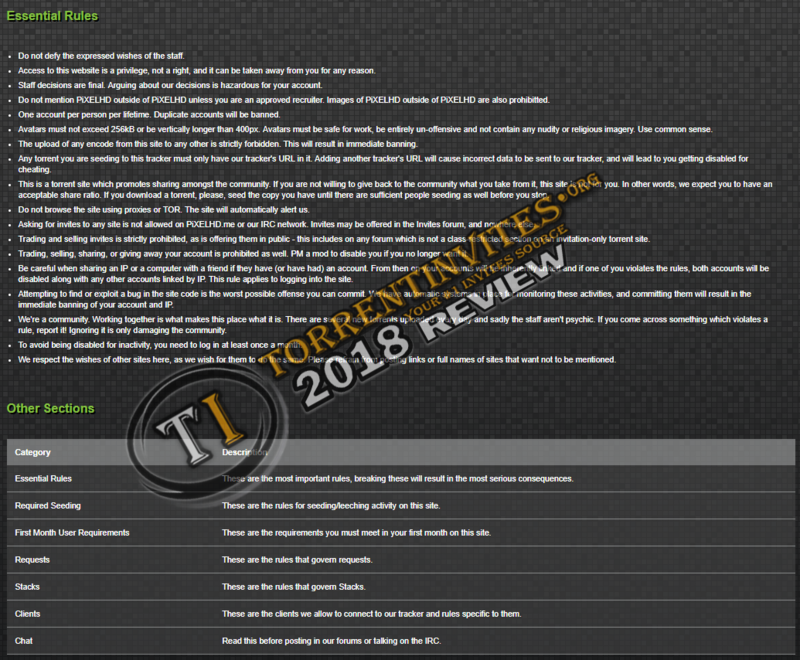 Invites are no longer provided to members - if you wish to join you must fill out the application form and supply three ratio proofs in the form of direct links (screenshots not accepted). Any member that asks for invites from staff will receive a warning! PxHD is a RATIOLESS tracker but this does NOT mean you are immune from needing to seed torrents. The current seeding rules are all downloads must be seeded for 72 hours or to a 1:1 share ratio. This is the same for any tracker.. seed until you bleed. The torrents found on PxHD are strictly exclusive to this tracker.. meaning you will not find them elsewhere. Members will find a mixture of both movies and TV. The community is booming.. forums are very active and there is always a conversation going on. Staff are regularly seen interacting with their members throughout the forums - very friendly and welcoming community. Donations are cheap and through PayPal.. as stated above you will not receive invites for donating but you will be given upload credit, bonus points, a donor heart and a warm fuzzy feeling (lol!). Donations start from 5euros and up to 100euros. Smaller donations do not receive inactivity immunity, this only applies to donations of 50 or 100euros.